In a world where the Roman Empire never fell but survived into the modern day a young member of the Imperial family faces having to take on a greater responsibility after The Emperor, his Uncle, falls ill in the middle of a diplomatic crisis with the Far Eastern Nionian Empire. Some of his enemies who forced him to go on the run three years previously are still a threat and his desire to one day abolish the Empire’s use of slavery still faces opposition. I enjoyed Romanitas, the first book in this series, although I thought it wasn’t as good as it potentially could have been. 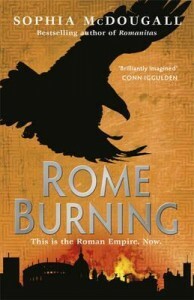 “Rome Burning” shares many of the strengths and weaknesses of the first book in the series, although I think overall it is an improvement on the first book. What I liked most about the first book was the characterisation and this continues to be a strength of the sequel. I thought Una and Dama were the most intriguing characters in the first book and the second book does provide some good scenes for them both, Una in particular has to make some tough decisions due to the conflict between her strongly-held principles and the Roman society she finds herself living at the heart of. The other two main characters in the first book weren’t quite as compelling, Una’s brother Sulien is likeable but at times is frustratingly passive although Marcus does get more interesting character development here and gains a greater maturity even as he also gains some flaws to go along with that. There are some interesting supporting characters, including the Japanese princess Noriko and the Chinese Dowager Empress. I had mixed feelings about the worldbuilding in the first book. The idea of a Roman Empire which never fell but has expanded and survived up to the present day is an intriguing alternate history idea, but I felt the world didn’t have much depth to it. The same is true here, although we get to see a bit more of the world it still feels a bit lacking in detail. The plot is a bit unusual in the sense that it’s not until the last hundred or so pages that there is a revelation that what has really been happening is more complex than it initially appeared. There are a few genuine surprises and at least three moments where the plot abruptly changes direction from where it seemed to be going. MacDougall is good at writing some very tense scenes, even if the ‘characters have to go on the run’ plotline might be a bit overused. Due to the main plot not being revealed until a long way through the book the first section of the book does feel a bit slow paced but the end of the book is much stronger and the overall storyline is more compelling than the story in the first book. I do have one criticism of the ending, while the first book could have worked as a standalone it was a bit annoying for the second book to end on a huge cliffhanger.